False Cut for Card Magic Tricks - Introduction. To support your card magic tricks, here's a cool "false cut" - an apparent cut of the deck that leaves all of the cards in their original order - that you can learn through my step-by-step instructions and video. It's a valuable utility move, in fact, it’s a true sleight of hand move, that you can always employ in your card magic. This false cut, which you execute on a table, separates the deck into three sections and brings them back together in their original order. As you’ll see in the accompanying video, the cut is quite convincing and looks as if you have mixed the deck. 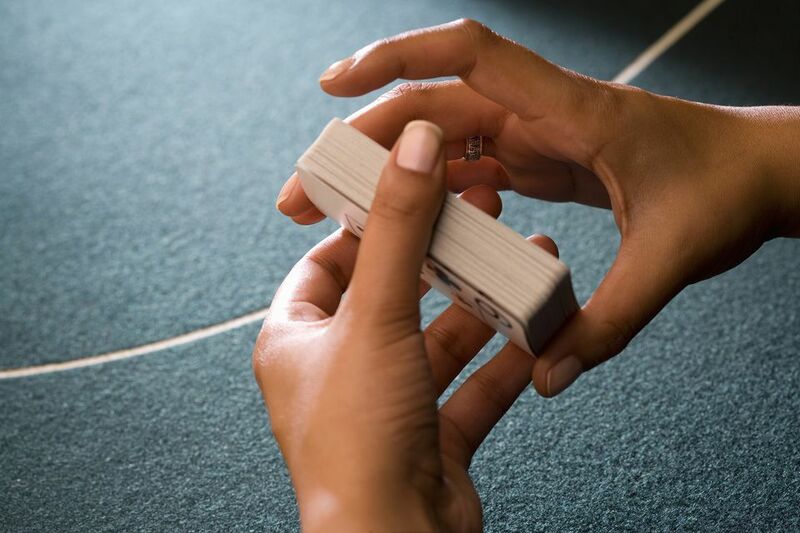 Now, when you’re ready to perform a trick where the cards are in a certain order, for example, “The Count Easy Magic Trick.” You can perform this cut to casually persuade spectators that the deck is in no particular order, even when it's not. I’ll teach you this false cut through step-by-step instructions and video. You can watch a video to view the false cut in real time and in slow-motion here. This move can also work as a card control. Have a spectator select a card and return it to the top of the deck. Perform the false cut and the card will appear to be lost in the deck. However, it's still on top. False Cut for Card Magic Tricks - Grasp the Deck. Grasp the deck as in the picture. The thumb and first finger of the right hand hold the lower third of the deck while the left hand holds and supports the upper two-thirds. If you are left-handed, you can simply reverse the directions. False Cut for Card Magic Tricks - Separation One. One tip, it helps if you hold section “A” with the middle portion of your thumb away from its tip. You’ll see why in a couple steps. False Cut for Card Magic Tricks - Prepare for the Second Cut. Bring section “A” from the bottom to the top, over the deck that’s held in the left hand. False Cut for Card Magic Tricks - Make the Second Cut. With the thumb and second finger of the right hand, separate, remove and hold the upper half of the (remaining) deck that’s held in the left hand and move it to the right. As you can see in the picture, this portion of the deck will be referred to as section “B.” You are now holding sections, “A” and “B,” in your right hand. False Cut for Card Magic Tricks - Prepare to Drop “A”. With the left hand, raise section “C,” which clears an area on the table to drop section “A” with the right hand. Prepare to drop section “A” on the table by lowering its left-hand edge to the table. False Cut for Card Magic Tricks - Drop “A”. Drop section “A” onto the table. It’s easiest and maintains the cards in a stack if you lower the left-most edge to the table and then lower the rest of the packet and quickly remove section “B” from under it. This advice will make more sense as you practice the move. 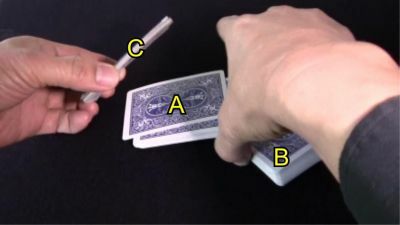 False Cut for Card Magic Tricks - Drop "C" and "B"
False Cut for Card Magic Tricks - Drop "C" and "B". Drop section “C” from the left hand on top of section “A” that’s resting on the table. Try to execute the cut quickly and efficiently. Ultimately, you’ll should be able to perform the cut without looking at your hands, or only glancing there momentarily. The cut should look casual as if you are really cutting the cards, and by not looking at the cards, you won’t draw attention to the move.